The tee has claimed multiple victories on the Champions and LPGA Tours. Including Gil Morgan’s victory at the Wal-Mart First Tee Open at Pebble Beach. As golfers discover the distance it adds to drives, it will be an essential in every golfer’s bag. 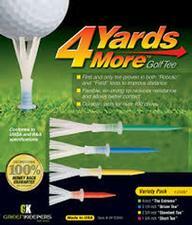 3 1/4 inch "Driver Tee"
2 3/4 inch "Standard Tee"
1 3/4 inch "Short Tee"
If you have any more questions about the GreenKeepers 4 Yards More (Variety Pack) Golf Tees Pack; do not see the model you are looking for; need custom options; or prefer to not purchase online, then please call us at (630) 656-1291.